Subaru is preparing the 2018 WRX STI Nurburgring 24-hour race car and they’ve given it some improvements. Last year, with only three hours to go, the 2017 Subaru WRX STI NBR suddenly caught on fire and was forced out of the race. Subaru Motorsports will return in 2018 and attempt three wins in four years. STI's Tatsumi Eiji will serve again as General Manager for the team and brings drivers Carlo van Dam (Netherlands), Marcel Lasee (Germany), Tim Schrick (Germany) and Hideki Yamauchi (Japan) who will all be back with the 2018 Subaru WRX STI NBR. Subaru improves the engine performance in the 2018 WRX STI NBR race car by reviewing the exhaust layout and optimizing the turbo effectiveness. Subaru Tecnica International (STI) also improved braking performance with the expansion of the front brake diameter. They also improved aerodynamic performance with new exterior parts and improved on the technology they introduced last year. 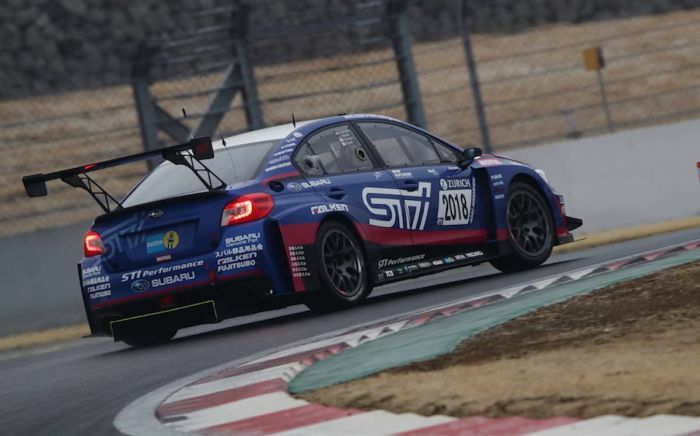 Subaru began testing the STI in Japan at their secret test track in January to get ready for the May race. They continue the shakedown of the high-performance machine with BRZ GT drivers Yokochi and Iguchi who will also join the NBR team this year. Iguchi drove the AWD race car for the first time who pushed the STI to a fast time. This year's theme for the 24-hour race is "to challenge Nur by human power.” The legendary Nurburgring 24-hour race takes place from May 10-13, 2018 and Subaru brings the 2018 Subaru WRX STI with new upgrades to attempt three wins in four years.